Krk Fair is a three-day open-air manifestation with a rich programme that attracts over 60 thousands visitors every year. Dating back to 1524, and being held with some interruptions ever since, the Krk Fair was originally a trade fair with merchants arriving from all over the Europe. At these far-away times, large ships sailed into Krk harbour full of goods from around the world. 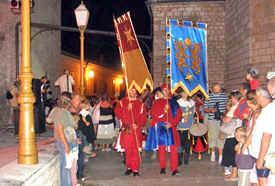 In the modern times Krk Fair has became a tourist attraction, traditionally held every August on the day of St. Lawrence. Wide range of products that will be exhibited on more than 200 stalls are locally made and aimed mainly at tourists and visitors. The rest of the Krk Fair programme offers open air concerts on not less than four stages throughout the town. Medieval costumes and role-play of medieval times, treasure hunt boat excursion and other events complete the fair. There will also be Treasure Hunt boat excursions every day during the Fair. Enjoy the video from fair held in the past and we hope to see you this year!